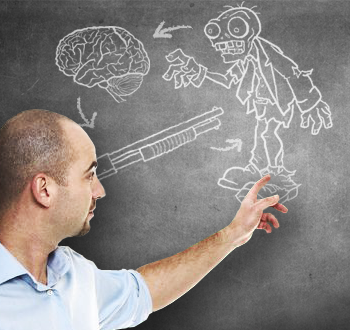 Zombies are the question, but guns, guns, and more guns is definitely not the answer. Zombies are scary in a very unique way. Like a lot of monsters, they look pretty gross, but that's only the most superficial of their frightening qualities. The real heart of their specific-brand of terror is what they represent, be it infectious diseases or the fall of civilization. Unfortunately, videogames rarely manage to get zombies right, reducing them to shambling targets whose only purpose is to get perforated with buckshot. Luckily, Chuck Wendig is both willing and able to educate the industry, and in Issue 303 of The Escapist, he outlines a few key areas where it's gone wrong. I regret to inform you that you have failed your Zombie Aptitude Test, or the ZAT ... Your failure is the result of the fact that you chose to answer every question on the ZAT with the multiple choice solution, "d: Shoot zombies with guns." ... Here's another good one: What makes zombies scary? Your answer? Ding ding ding. Give the test-taker a kewpie. "Shoot zombies with guns." Through a series of "electrifying" lessons, Wendig shows the industry the proper path, and reveals why treating zombies like just another enemy to be slaughtered is a waste. You can read more in his article, "How Games Get Zombies Wrong."